You probably shouldn’t name your son Frodo, but here’s a Tolkien-inspired name that’s more chic than geek. Thanks to Charlotte Vera for suggesting Rohan as Name of the Day. Back in the eleventh century, native son Alain de Rohan became the Viscount de Rohan. (The family traces their roots back to a semi-legendary fourth century ruler of the region.) Over the centuries, the family held the titles Duke and even Prince. Beyond the titles, members of the Rohan family distinguished themselves in military and religious roles. And while Alain’s direct line has died out, their palaces remain – in Vienna, Bordeaux and elsewhere. Finding the origins of Rohan itself is far more complicated. Some suggest that it is related to a Gaelic word for red, or possibly shares origins with the rowan tree. (And the tree? The tree’s name might link back to the word for red, too. Or not.) None of the explanations seem perfectly reliable, so let’s just call this one a place name and a family name. Unless, of course, you’re thinking of the Sanskrit rohana – ascending. In the 1960s, Indian cricket sensation Rohan Kandhai wore the name and led his team to a World Cup victory. You’ll find plenty of Rohans of Indian descent today. But Rohan almost certainly owes his success in recent years to JRR Tolkein. (Though there’s ample evidence that the author borrowed the name for his fictional place from the noble family.) Rohan first charted in the US in 1995, some years before the 2001, 2002 and 2003 releases of Peter Jackson’s blockbuster adaptation of the trilogy. Rohan climbed with the films’ success, and in 2004 the name peaked at #480. About 4,000 boys have been given the name since 2000, so he isn’t a true rarity. But compared to more than a quarter of a million Jacobs, Rohan is fairly uncommon. Today he stands at #528 – fading slightly, but still in use. The -ro sound also appears in the extravagant Romeo and Rolando, as well as trendy Brody and Brogan and the saintly-but-dated Jerome. Rohan is heard throughout the English-speaking world with pronunciations ranging from RO han to ro HAHN to RO an. It’s one of the name’s downsides. But overall, Rohan makes for a pleasing choice especially for parents seeking a globe-spanning name. With cultural associations from Ireland to India, Rohan boastst true international flair. Factor in that Bob Marley bestowed the name on his son (now all grown up and married to musician Lauryn Hill) and his cool factor is considerable. Just don’t name your daughter Arwen, too. While I love the word Rohan, I don’t think I’d use it as a name for a child. BUT, I’ve long been a fan of Ronin for its Japanese samurai background. My Asian theatre classes in grad school were a huge influence on research interests and teaching philosophies. I probably can’t ever convince my husband to use it were we to have a son one day, but it’s a guilty pleasure, for sure. Charlotte, boys’ names are suggested far, far less frequently than girls’ names. I keep lists from readers to work through, but I often find that I need a boy NotD anyhow. And Jo, that’s great! I do think parents could’ve named a Duggar-sized family after LotR pre-2001. But once the movies were out? It’s a little much. Too bad, because there are some fabulous choices there. I also noticed that Bewildertrix feels strongly about the link between Rohan and the Gaelic name. Interesting … I’m fairly confident that’s her background. 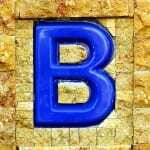 If you’re out there, Bewildertrix, please weigh in! Hahaha, your last comment? I went to high school with a girl named Arwen, and yes, her brother’s name was Rohan. It was fantastic! Wow, that was fast — I only suggested this name a little over a month ago! After emailing you I looked the name up and discovered that it had a much broader history and heritage than I’d originally thought. Since I’m most familiar with the Sanskrit and Tolkien versions of the name, I pronounce it “RO-hahn”. 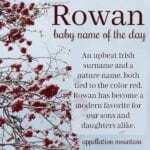 I only recently found out that the name was in use as a “Rowan” alternative and could in fact be pronounced that way. Incidentally, while the Rohan I knew growing up was of Sri Lankan descent, he had been adopted by Dutch parents. They chose to retain his birth-name, seeing as it worked quite well in a country where names like Johann and Hans are in use.